… in “/etc/apache2/envvars” to my Linux user name. I had to do this because I’m sharing files in my home directory which cannot be set to the usual web server permissions. 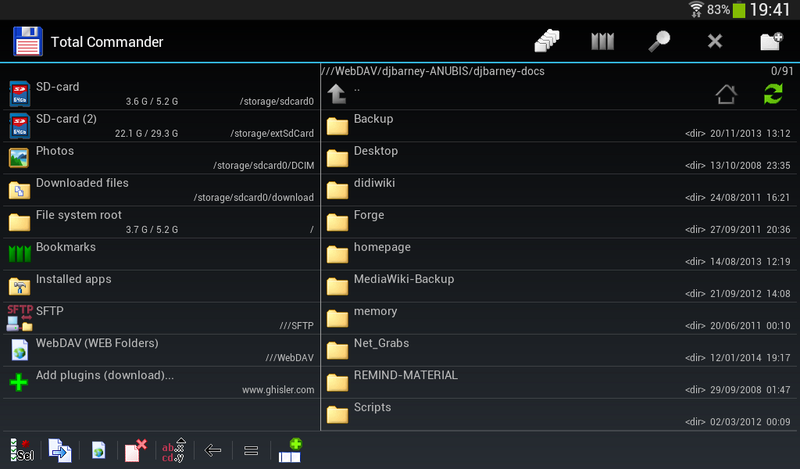 Notice the line starting with “///WebDAV” in the screen shot above taken from my tablet. That is a directory on my home PC. This is using Total Commander with the WebDAV plugin. 1. Behind a fire walled router. 2. Using encrypted WiFi that needs a password. 3. On my BT router the WiFi is separated from the internet. Local “LAN” addresses (the usual “192.168. …”) cannot be accessed from the internet, only from the home network. I must admit I was a bit unsure of moving away from my wired LAN network simply because WiFi can be seen (but not accessed) by anyone near by. But I think the convenience out ways the risks, and what we’re looking for here is easy access and usability. Becoming obsessed with heavy security, needs to be balanced with giving the user easy access to their files. Why do so many people recommend Samba for file sharing to people who just want to share files through their home network ? It is not at all an appropriate suggestion and seems to be based on a couple of damaging myths …. 1. “Samba makes life easy”. Wrong. Samba is a huge, complex and messy application that is designed for large corporate networks. It can go wrong in any number of ways and is not easy to set up. 2. “Samba solves the problem of sharing files between Windows and Linux”. Wrong again. In fact very wrong. Samba has simply not been required for years because something called WebDAV has been built into Windows since Windows 98, as well as Linux. WebDAV is a name for internet file sharing using the same system that serves our web pages to us. It was bought to us years ago by the same people that invented the HTTP protocol which is the basis for the World Wide Web. It runs using the widely used Apache web server. You might have seen it named as “Web Disk” on your WWW host. That’s WebDAV.